See also our post on How to measure boule to jack. Measuring is part of the game of petanque and every player should carry a tape measure. When shopping for a tape measure, here are my selection criteria. It should have metric markings (millimeters, centimeters, etc.). Metric markings are traditional for petanque and they are easier to read than imperial (feet and inches) markings. A tape with both metric and imperial markings works well. It should be long enough to handle 95% of the boule-to-jack measurements— at least 6 feet (2 meters). It should be small enough and light enough to be carried comfortably and pulled out quickly and easily. This is an important criterion. It should have a standout of at least a meter. (A tape’s “standout” is the length to which it can be extended without bending under its own weight.) In practice, this means that it should be at least 3/4″ wide. A narrower tape will flop around like a wet noodle if extended more than a few inches. It should be reasonably priced. Note that a tape’s product description isn’t a reliable indicator of the way the tape is marked. Some tapes, for instance, are described as 5m/16′ but are marked only in feet and inches. There are two different styles of printing numbers on a tape, and the style affects the readability of the tape. Generally speaking, a tape with continuous marking is easier to read than a tape with interval marking. The color and size of the numbers also affects readability. Numbering styles, top to bottom— Komelon, Ace, Fastcap. Komelon has continuous marking by centimeters. Ace has interval marking by centimeters, with intervals of 10cm. Fastcap is marked in millimeters, in intervals of 10mm. 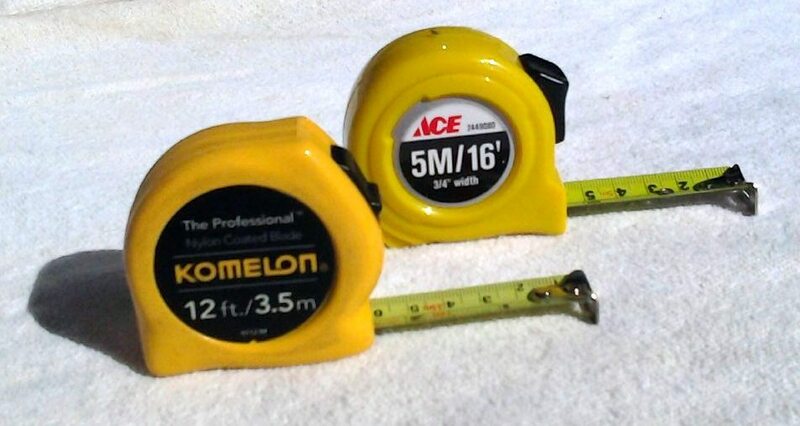 Here are a few tape measures that I think are worth considering. Note that you want to avoid buying a tape measure with a magnetic hook or end. You don’t want your magnetic hook to pull and move boules while you are trying to measure. The Komelon 4912IM is available on Amazon for about $6. It has dual markings with English and continuous metric marking in centimeters. It is small, light, and easy to carry. It is the only tape measure that I’ve found that has continuous marking in centimeters, which makes it unusually easy to read. After less than 5 years of light use the sliding locks on several of our Komelons have seized up and no longer work. Our Ace seems to be well-made, but we haven’t had it long enough to report on its durability. The Fastcap True32 metric reverse 5-meter tape is what I carry. It is bigger and heavier than I would like, but I find that its metric marking are very easy to use. Its length of 5m makes it possible to measure to 10m, if you do it in two steps. The Hultafors Talmeter (metric) tape is a favorite of umpires. It is a locking rule (i.e. the tape is locked in place by default; you press a button on the front of the case to unlock the tape so that it can be extended or retracted), and it has a short rear extension that can be flipped out. These two features mean that it can be used like an umpire’s folding rule, to compare distances without actually reading measurements. It can be used to make precise comparisons of distance, even when the distance is more than 1 meter. It’s not cheap (about $25 on amazon) so it may be overkill unless you are a certified umpire. A number of other tape measures have a similar “autolock” feature (instead of pulling the tape out and pressing a button to lock it, you simply pull it out and it stays out until you press a button to unlock and retract it). This is a nice feature, but without the folding extension of the Hultafors Talmeter, internal jack-to-boule measurements are too clumsy to be practical. In the past I’ve used an old wooden carpenter’s ruler made by Lufkin and it worked well. However, the wooden folding carpenter’s rulers that are being made today (still by Lufkin) seem to me very shoddy, with poorly machined sliders, and I cannot recommend them. In addition, the segments on a carpenter’s ruler are longer than a true petanque umpire’s folding ruler, so the minimum distance internal boule-to-jack distance that you will be able to compare is about 18cm. If you are seriously into precise measurement, unquestionably the best choice is the Obut fiberglass umpire’s ruler, $20 from Petanque America (as of July 2018). The segments are short, so it can compare lengths as short as 11.5cm. The extension has a smooth action; it isn’t loose in the channel and it doesn’t bind. Click below to see larger images. 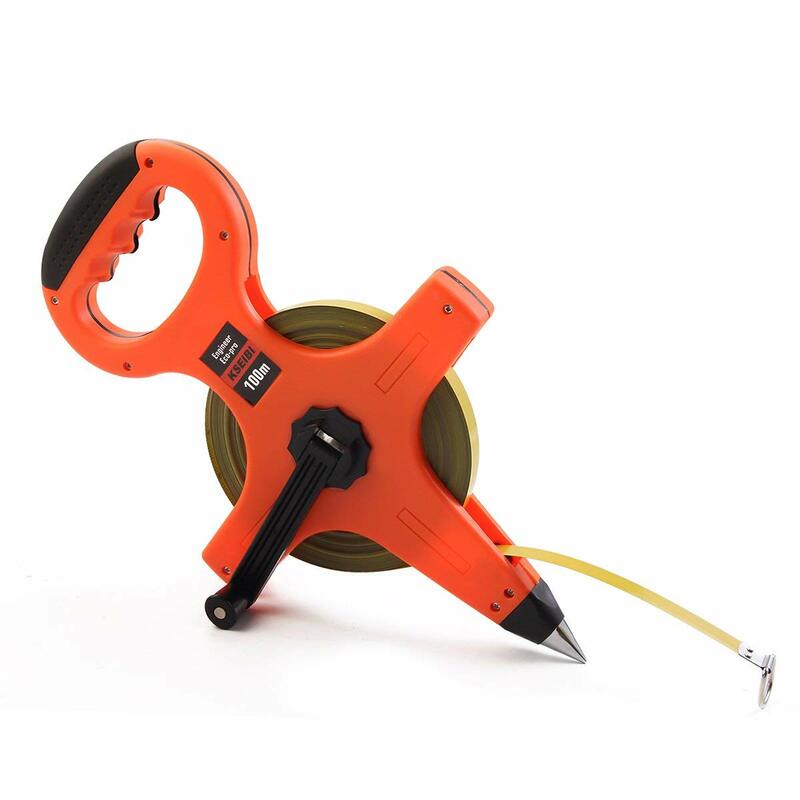 For a long tape measure, you do NOT want a “retractable” tape; that is, a tape with a spring-loaded retractor. A spring-loaded retractor is a safety hazard— a long tape zipping back into the case can cut your hand badly. What you want is a tape that you rewind using a hand crank that folds out of the case. 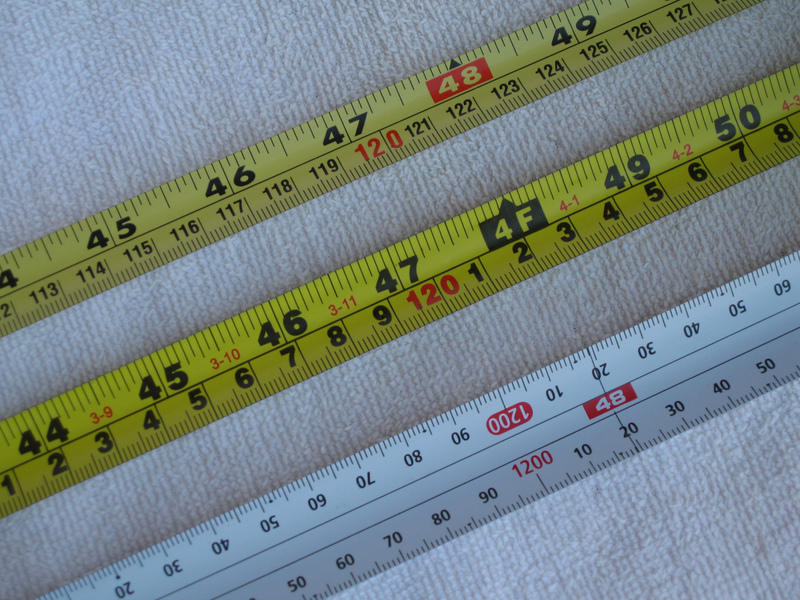 Most long tapes available in the USA are marked on both sides of the tape— one side is marked in feet and inches the other side is marked in meters and centimeters. 20m tapes don’t seem to be significantly more expensive than 10m tapes. A 20m tape will of course be slightly bigger and heavier than a 10m tape, but it may be more useful, for example, if you want to lay out a 15-meter-long piste, or if you have a use for it off of the petanque terrain). Note that long tapes also come in an “open reel” design. An open reel design is good for some tasks, but it is large, clumsy, and not a very good choice if you want it only for measuring in petanque. WORKPRO Long Tape Measure 100Ft/30m Fiberglass Measuring Rule Double-Sided Scale of SAE and Metric Tape Ruler At 30m it is probably longer than you need and heavier than you might want, but the price is good and the reviews are very positive.